KUALA LUMPUR: Rental rates for purpose-built offices in Kuala Lumpur were generally stable in the last three years, except for certain suburban and city centre areas which showed an upward trend, according to the 2011 Purpose Built Office Rent Index (PBO-RI) for Federal Territory of Kuala Lumpur. “Looking at the data... the market is still good,” National Property Information Centre (Napic) director Dr Zailan Mohd Isa said at a pre-launch briefing of the 2011 PBO-RI which will be launched today. The rent index has four regions, namely Kuala Lumpur City Centre-Golden Triangle (KLCC-GT), Centre Business District (CBD), within city centre (WCC) and suburban. According to the rent index, average monthly rentals for purpose-built offices in the WCC region had increased gradually from RM2.92 per sq ft in the first quarter of 2009 to RM3.46 per sq ft in the fourth quarter of 2011. This meant that average monthly office rentals in the WCC region had increased 18.5% over a three-year period. It was also noted that average monthly office rentals in the suburban region had appreciated by 13.2% over a three-year period, rising from RM3.10 per sq ft in the first quarter of 2009 to RM3.51 per sq ft in the fourth quarter of 2011. The suburban region includes Bangsar, Bukit Kiara, Damansara Heights, Jalan Pantai Baru, Jalan Istana and Jalan Syed Putra. “Companies may be relocating to the suburban areas,” said Zailan. 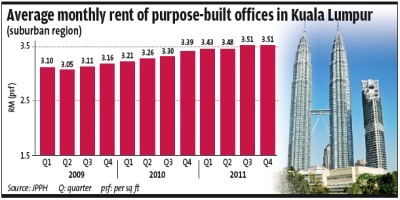 Meanwhile, although the KLCC-GT region is the most sought after location in the city, average monthly office rentals were stable (a slight rise from RM4.60 per sq ft in the first quarter of 2009 to RM4.66 per sq ft in the fourth quarter of 2011). However, the CBD region suffered a drop in average monthly office rentals, from RM3.46 per sq ft in the first quarter of 2009 to RM3.27 per sq ft in the fourth quarter of 2011. For the entire Kuala Lumpur region under review, average monthly office rentals had increased sightly over a three-year period, from RM3.91 per sq ft in the first quarter of 2009 to RM4.04 per sq ft in the fourth quarter of 2011. The rent index, which will be produced on a quarterly basis, is developed by Valuation and Property Services Department (JPPH), with assistance from Universiti Teknologi Mara (UiTM) and University of Malaya. Zailan said it was the first rent index of its kind in the Asean region. The rent index defines purpose-built offices as buildings with office use of not less than 75% of net lettable area, and has compiled rental data from 6,831 tenancy leases from 167 buildings. Zailan said the rent index's aim was to provide a guide on current market rentals for investors, and a benchmark for the financial stability of the country. “We also want to attract multinational corporations to set up regional headquarters in Kuala Lumpur,” she said. Zailan also said the PBO-RI would be expanded eventually to cover all the major cities and towns in Selangor, followed by Penang and Johor. PETALING JAYA: Ken Holdings has proposed to acquire land owned by Malaysia Building Society Bhd (MBSB) for RM56.17mil for the development of a green township. In filings with Bursa Malaysia, the company said it would be acquiring the entire stake of MBSB's unit, Gadini Sdn Bhd. Gadini is the registered and beneficial owner of four parcels of land measuring a total of about 992,433 sq ft in Johor. The company said the estimated gross development value and cost for the potential development of the properties is about RM1.2bil and RM914.5mil respectively. “The proposed development is hence expected to result in an estimated gross development profit of about RM300.9mil for the Ken Holdings Group over the next six to seven years commencing in 2013. It's too preliminary to ascertain the exact gross development value, gross development cost and gross development profit for the proposed development at this juncture,” it said. PETALING JAYA: Hua Yang Bhd posted a higher net profit of RM16.47mil for its first quarter ended June 30, compared with RM11.48mil in the previous corresponding period. Revenue surged to RM97.96mil from RM61.75mil previously. In filings with Bursa Malaysia, it said steady construction progress recognition especially for its service apartments projects in Klang Valley including One South and Symphony Heights as well as Taman Pulai Indah in Johor Baru and Bandar University Seri Iskandar at Perak were the major contributor to the higher revenue and pre-tax profit.